My husband was stunned by how easily and intently our three-year-old was playing with the handmade number cards that her aunt sent her for Christmas this year, and I have to admit, I was, too! Of course she still plays with her new dollhouse, belts out “Go Tell It On The Mountain” and “Happy Birthday” on her Hello Kitty karaoke machine, and really loves her new dwarf hamsters, too. But the number cards were the surprising star of her Christmas gifts. I love their contribution to natural learning in our house! Simple and handmade, the cards, made with natural materials, are versatile, quiet, and soothing. Abbey names the numbers, puts them in order, traces the embroidered edges to “write” the numbers with her fingers, and lends a card to her brother when he wants to be in on the game. And when it ends up in his mouth, it’s okay – no small parts or toxic chemicals, and a quick press with the iron smooths out any drooley spots or crinkles he leaves behind. Who would think that a simple set of cloth number cards could be so fun and beloved? But they absolutely are. Her favorite game is the “knock knock game” that you can read about in Meg McElwee’s tutorial for her number cards in the book Growing Up Sew Liberated. Number cards are wonderful, and Abbey plays with them tirelessly. There is a tutorial, pattern, and many games for these cards in Meg McElwee’s book Growing Up Sew Liberated, but the cards are themselves are simple to make, and I’ll outline a basic how-to here. White or neutral cotton (scraps are fine!) (the size of the cards will be 3 X 4 inch pieces and there will be 10) You could absolutely recycle outgrown (and too stained to re-use) clothing or bedding for this! Iron your colored/patterned fabric scraps onto the fabric adhesive, following the instructions on the package. Trace or draw the numbers onto your colored/patterned scraps (already backed with the iron on adhesive paper) with tailor’s chalk (in a pinch, sidewalk chalk works just as well!) and cut them out. Make sure that you make your numbers large enough to allow for the embroidery thread “outline” that you’ll be adding in step 4. 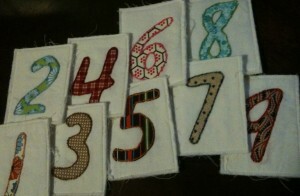 Use your embroidery needle and thread to embroider an outline around each number. You want to sew through the number fabric and the background fabric, and keep your stitched close together and overlapping a bit. Sandwich two layers of cotton batting, felt, or fleece between the fabric with the numbers adhered and embroidered and another piece of your neutral cotton (your cotton should be on the top and the bottom, right side facing out, numbers facing up) and pin in place. Follow the guidelines that you drew in step 3. to sew a straight stitch through all four layers of fabric, in a rectangle around each number. Remember to backstitch to secure the thread at the beginning and end of your stitching. Carefully cut the rectangles out approximately 1/4″ from your stitching. At this point you can serge or otherwise finish your edges (using a zig zag or overlock stitch), or you can leave the edges bare and rough. You could also use Fray Check to make sure that the edges don’t fray, but I like the fraying edges and I don’t worry about Joseph chewing on them! This project was originally completed by my sister-in-law, who used the tutorial in the book Growing Up Sew Liberated by Meg McElwee of Sew Liberated. My outline of steps above is the way I developed to recreate the cards that my sister-in-law made for me, and is only one way that this project can be completed. It is not reproduced in any way from Meg McElwee’s book. Growing Up Sew Liberated is a wonderful book full of sewing projects to enliven any sewing machine and seamstress (and of course, please the children who get to use the objects made!) See Meg’s blog, Sew Liberated, to read more about her family, projects, and writing – and check your local library or bookstore to find her lovely books! I love this! Sasha is currently very into cards and this would give her some of her own. I think this is a great idea! Thank you for these instructions. 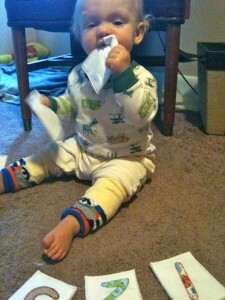 It is not easy finding time for sewing between work and watching my nine-month-old son, but I think i will have to crave out some time. I love this! Could also be done with ABC’s! I’m so going to do this once my sewing machine is fixed (my wrists are shot so I can’t hand sew or I’d be doing it tomorrow).